This page, RCA Tokens, lists all the confirmed recordings and one's I believe to have been recorded before The Tokens set-up their own B.T.Puppy record label. The listing of the discography should be clear but do let me know if you find any difficulty understanding it. There are lots of articles on The Tokens story, many containing inaccurate information that has been carried over to other printed and web media. I'm concentrating mainly on their work in the studio, not their personal history but as well as background info on the recordings there are other details I deal with in the notes. (Margo, Margo, Medress, Siegel) ? (Sedaka, Greenfield) Neil Sedaka & The Tokens Guest Star G 1448 64? 'New Version' Tonight I Fell In Love The Tokens & Various Artists York YS 5001 70? *1 Formed as The Linc-Tones with Neil Sedaka, Hank Medress, Cynthia Zolitin and Eddie Rabkin in 1956 there was soon a change of name to The Tokens and personnel when Eddie Rabkin left and was replaced by Jay Siegel. Accounts differ as to whether Jay Siegel was on the only record released on Melba at the time but later recordings from this period clearly feature his vocal. 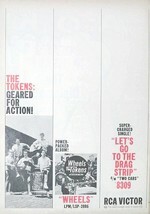 Guest Star was one of those cheapo album record labels that released a few old tracks by a current charting artist or two with filler tracks by a studio group or band. Many of these type of releases contain little treasures, in the case of Neil Sedaka & The Tokens two finished masters from Morty Craft's Melba label. All doowop lovers bend a knee to Ed Engel and his wonderful Crystal Ball releases and The Tokens have been particularly well served by two CD's, one a double. Golden Moments has three cuts from the Melba period, Jay Siegel's lead on "Laura-Lee" and Cynthia Zolitin (I assume wrongly credited to Linda Colletti in the CD notes) with "Lover Lips" and "Everybody Knows". I'll be returning to these CD's and there previously unreleased tracks many times, only problem is the lack of recording details. "I'll Never Have To Dream Again" certainly sounds like a pre RCA cut. *2 Neil Sedaka left The Tokens and it wasn't long before he was finding fame and fortune as a writer and performer. Hank & Jay formed a new group, Darrell & The Oxfords with Warren Schwartz & Fred Kalkstein. Signed to Roulette Records the group had a modest hit with Picture In My Wallet but the follow-up failed to arouse much interest and the group split. *3 Hank Medress planned to produce an instrumental for Roulette Records and Phil & Mitch Margo demoed a boogie woogie version of "Chopsticks". The demo didn't workout but a relationship was formed and following the break-up of Darrell & The Oxfords, Medress and Siegel joined with the Margo brothers and The Tokens we know and love were formed. They celebrated with a top 15 hit and an eventual million-seller for Warwick Records. Produced by Catalina Records, Fields-Madera Orch. *4 Any interest in The Tokens and you'll have read something like this: "After their RCA contract was up, The Tokens signed with Laurie for one single before forming B.T. Puppy...." However The Tokens were still signed to RCA, and the session info shows they were recording for RCA at least until 16 Dec, 1963. On February 10th, 1962, Billboard featured this snippet "RCA Victor's exclusive recording contract with the Tokens expires April 24, 1962, but the label holds two one-year options." Must assume RCA exercised their two options, so come April '64 The Tokens could get cracking with their own B.T. Puppy label. So how to explain the Laurie release? Well I can't confiirm the details but take a gander at the label credit, Prod. by Fields-Madera. 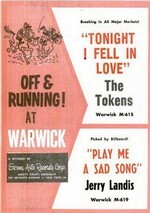 The same pair who are credited with the orchestra on The Tokens earlier Warwick Records release. In Jay Warner's essential "The Billboard Book of American Singing Groups - A History 1940-1990" he writes, "...they recorded four songs in three hours at Allegro Studios in the fall of 1960. The songs were "Please Write", "I'll Always Love You" (The two titles on the Laurie record. ),"Wimoweh" and "It's Imagination" which was rewritten into "Tonight I Fell I Love". It could be that this 45 was the early session or Morty Craft's slightly later arrangements, perhaps with a bit of sweetening by The Tokens that gained a release on Laurie Records. *5 Music Makers was a New York record label, most known amongst doo-wop collectors for the almost hits of The Imaginations. The first mention I found of The Tokens track was in Vol. 2 of Stax-O-Wax's 45rpm Directory; no b-side is listed. Since then other discographies have assumed it must be the later Tokens track "A Girl Named Arlene" and dated the release as '64. Not so, Ed Engel's Tokens compilation "Tonight I Fell In Love" includes "Arlene" listed as unreleased, I assume it must be the same song. I've not seen a copy of the 45, nor do I know anyone who has. It appears that after their initial session for Warwick Records The Tokens didn't record for Morty Craft's record label again. Music Makers had there own studio in New York City, The Tokens could have recorded at the studio between their Warwick hit and signing for RCA. Whether they had signed or agreed to the 45 being released could explain why no one seems to have a copy! There again the listing might just be an error by the original discographer of the Music Makers label. *6 And here's another single I have no concrete info for! Again this single is listed in Stax-O-Wax and picked-up by later 45rpm discographys, but did it ever get to the pressing plant? And if so, care to share the info?! I assume this was a release/planned release of the Music Makes tracks; this one includes a marvelous sounding b-side "Rumble In The Park" but it could be a new recording. The Tokens by this time had a very close working relationship with Laurie/Rust and maybe they recorded a session or two before they had officially left RCA. Rather disappointingly Rust 5094 was released but by Dean and Jean "7 Day Wonder" / The Man Who Will Never Grow Old". Not to say that The Tokens cuts weren't planned and that "Rumble.." wasn't recorded by the group. Any info gratefully received! *7 Eight original hits from Morty Craft's record labels Warwick, Lance, Melba etc on Side One while Side Two features the same tracks 'updated' for the 70s. Must confess I like the album, Mr. 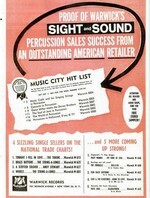 Craft did get some fine music out on the streets in the late 50s early 60s. I bought the LP in the early 70s when I hadn't heard all the tunes and although I couldn't really hear much difference between the versions, no disco beats or anything just playing about with the mixing really. In regards to The Tokens track the then and now sides are virtually identical. Conceived, produced, arranged and conducted by Morty Craft. *1 The credit on all the RCA 45s and LPs is artist The Tokens, Hugo & Luigi Producers and Orchestra conducted by Sammy Lowe, unless noted. Release dates are approximate. Originally recorded as one of the four songs The Tokens demoed for Morty Craft at Warwick it was Jay Siegel's arrangement of "Wimoweh," with the addition of new lyrics and a change he made to the melody that created one of the most endearing songs of the last 50 years. *1 On the label M, M, M, S actually reads (P. & M. Margo, Madress, Siegal). 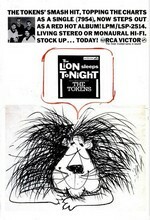 The album credit for "The Lion Sleeps..." has the same writer credit as the UK single. Billboard LP Chart No. 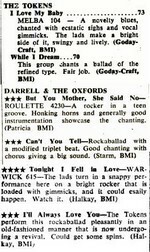 54 10th March 1962, 16 weeks on the chart. *3 Maybe it is a cash-in album of old tracks and doo-wop style recordings that hadn't been released when originally recorded but the music is none the worse for that. *4 The unreleased tracks, great sound and good session info makes this an essential purchase. Four previously unreleased cuts are noted but one "I'll Do My Crying Tomorrow" was out on 45 and the matrix # shows it to be the same cut. To make up for this though one of two Alan Lorber conducted sides "Somewhere There's A Girl" is included and the recording date strongly suggests this with "You're Nothing But A Girl", released on "Again", were imtended to be RCA 47-8174. Global Dog Productions 45 RCA discography credits this 45rpm, without titles, to The Tokens as 'not issued', unless you know better! *5 Just a guesstimate that these tracks, off Ed Engel's second set of rare/unreleased Tokens cuts, are from their RCA period.